Hand engraved cuff links will add an extra special accessory that has personal meaning and a unique look to your shirt. 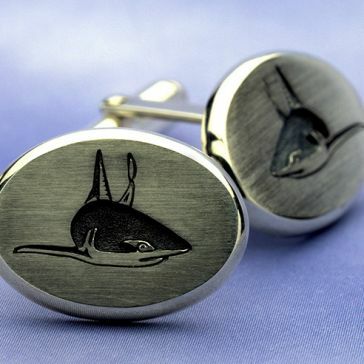 At John W. Thompson and Son in Sydney we can help you decide on a custom message for your cuff links. Cuff links are a great gift or a treat to yourself for a wedding, an important meeting or special occasion. 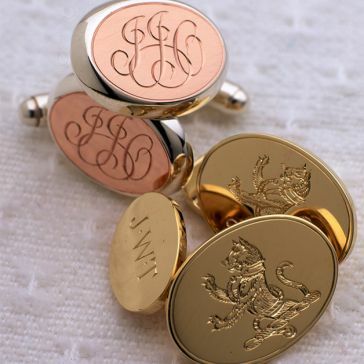 By adding a personalised message or design to your outfit, you can savour your cuff links forever and wear them knowing they are extra special. Why get a hand engraved cuff links? Hand engraving lasts for generations, meaning your precious piece may become a timeless family heirloom; providing generation after generation with the radiance of a personalised piece. Machine engraving, on the other hand, is unable to control the depth of the cut. The pressure exerted by the machine then leaves a weakened spot in the piece, with a significant portion of the metal removed. Unfortunately, as the piece is then worn and bumped it may break or snap. While it takes four times longer to engrave by hand as opposed to a machine, the results are well worth the wait. And to wear your cuff links for a special occasion, knowing that they have a custom message engraved into them can be very rewarding. 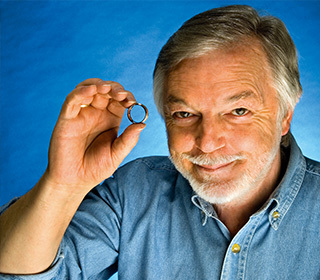 At John W. Thompson and Son we pride ourselves on crafting the treasures of today, family heirlooms of tomorrow and antiques of the future. The possibilities are endless when engraving your precious metals. 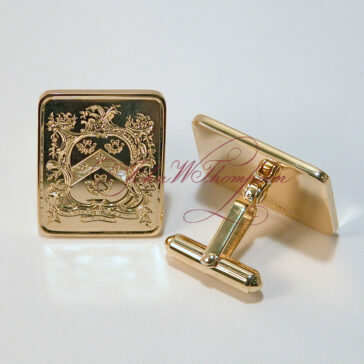 Cuff links are often quite small and suit initials, a small crest, image or symbol. Whatever you decide to engrave, the options are endless! Cuff links can be a meaningful his and her wedding gift that will become a keepsake or family heirloom for years to come. Often it’s hard to decide what gift you want to give to your future husband for his special day, cuff links that have been hang engraved to a personal message are the perfect memento. Your wedding day is about celebrating your eternal love, so why not celebrate with something you can keep forever! For more information about the services of John W. Thompson & Son, contact us today.